Warren Buffett isn't worried that the post-election euphoria on Wall Street has gotten out of hand. Yes, the Dow has skyrocketed 2,400 points since President Trump's victory, and the Dow is in the midst of its longest streak of records since 1987. But Buffett hasn't lost his legendary optimism, despite warning signs about the Trump rally. "We are not in bubble territory or anything of the sort," the billionaire told CNBC on Monday. The key, Buffett said, is that interest rates remain extremely low. That makes stocks look like a good deal by comparison. "Measured against interest rates, stocks are actually on the cheap side," Buffett said. Of course, the risk is that rates finally rise, especially given the Federal Reserve's plans for several rate hikes this year and Trump's promise to stimulate the economy despite low unemployment levels. "If interest rates were seven or eight percent, these (stock) prices would look exceptionally high," Buffett said. Buffett is a reliable optimist when it comes to the U.S. stock market. But his latest endorsement of stocks comes at a time of growing concern that the Trump rally has gone too far, too fast. 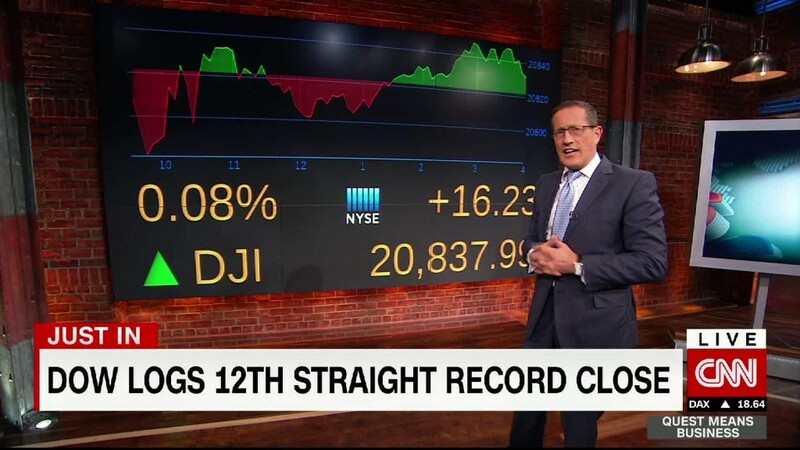 Not only has the Dow closed at a record in each of the last 11 trading days, but all three major indexes ended last week at all-time highs. Another sign of the upbeat mood on Wall Street: CNNMoney's Fear & Greed Index was recently flashing "extreme greed," though it's since cooled off to simply "greed." It's also tough to argue the stock market is a bargain, at least when it's looked at by itself. One common way to value the market is to compare prices to projected earnings. By that metric, the S&P 500 is trading at 17.7 times its projected earnings for the next 12 months, according to FactSet. That's the highest price-to-earnings ratio since May 2004, FactSet said. But the key, according to Buffett, is that the 10-year Treasury yield is sitting at just 2.33%. That's not only low historically, it's actually down considerably from nearly 2.6% in mid-December. Instead of waiting for prices to cool off, Buffett and his Berkshire Hathaway (BRKA) are still buying. Late last year Berkshire ventured into airlines, an industry Buffett previously bashed as a "death trap." The billionaire revealed to CNBC on Monday that earlier this year Berkshire more than doubled its stake in Apple (AAPL), giving it $17 billion of the iPhone maker's shares. Buffett also said "we've got no intention of selling" out of Berkshire's long-term holdings, including scandal-ridden Wells Fargo. In November, Buffett told CNN's Poppy Harlow that he hadn't sold a single share of Wells Fargo (WFC) despite the bank making a "terrible mistake" by keeping in place sales goals that "corrupted people."